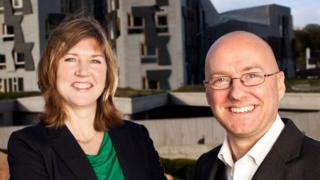 Alison Johnstone has been appointed as co-leader of the Scottish Greens' parliamentary group alongside Patrick Harvie. Mr Harvie had previously held the role, which includes speaking at First Minister's Questions, on his own. Ms Johnstone said the Greens had gender balanced roles throughout the party, which also now applied to Holyrood. Maggie Chapman will remain a co-convenor of the party's national council.